Come and join us at our base in Provence for a chance to take on Mont Ventoux with the Santini Gran Fondo and explore the cultural and gastronomical highlights that make the Vaucluse area so special. We are delighted to have this tour on the roster as it gives us a chance to host guests at our home. The Ride and Seek European base has been based here for 3 years. We very much look forward to showing you the road less travelled in an area that has long become a mecca for cycling. 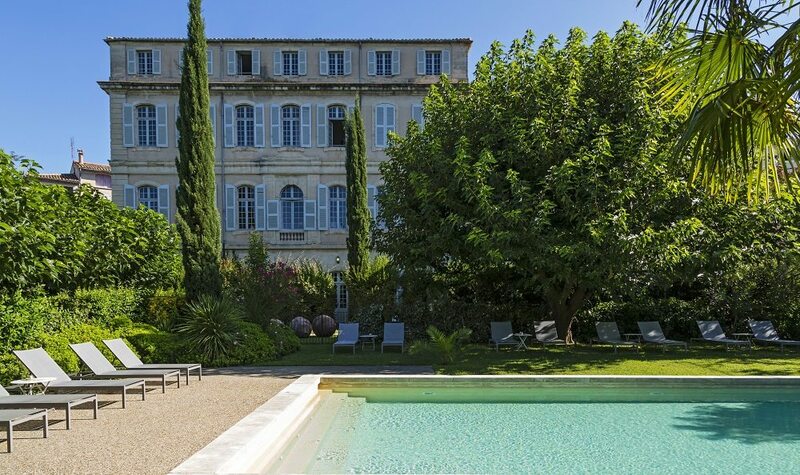 Over the course of one long weekend you can tick off one of the great cycling experiences whilst also enjoying a wonderful immersion into life in Provence. Dylan has been designing and running bike tours since 1997 and it was this experience that provided the bedrock behind the creation of Ride & Seek. Family bike tours were the original inspiration though with the 1988 Land End to John O’Groats trip his first ‘Epic’. He is now based with his family in the shadow of Mont Ventoux where the tour operations are based. Born in Zambia he has travelled extensively and has called Australia, Italy, Spain. England and now France home over the years. An itinerant lifestyle of professional squash, snowboarding and cycling have provided a wonderful passport to explore the world. Chaperoning my younger sister on the 4km ride to primary school every morning. My Mum would often follow in the car, out of sight, to check we were ok. It was my first experience of guiding! On tour I really like my Lynskey Sportive. In terms of pure aesthetics I’d go for anything from Look. Whist I have Mont Ventoux on my doorstep there are a number of climbs in the vicinity that I enjoy more. The Col de Murs in Provence is probably my favourite. Take the whole family on one of the Epics! I think I’m a bit of a jack of all trades from a guiding perspective having done it for over 20 years now. After all that time I guess my special skill is to be as passionate about guiding as I was when I first started. A Fiorentina steak washed down with a fine bottle of Brunello di Montalcino in San Gimignano on our Hannibal tour. English, French & Italian. I’m determined to improve my Spanish before we embark on a tour program in the Iberian peninsular. I’ve led all of them to date. James has been with Ride and Seek since the start and is one of our most valued guides. A photographer by profession he lives in the Alps with his wife and daughter. During the winter he is kept busy taking photos all over the Alps and then comes on board to guide tours in the summer. 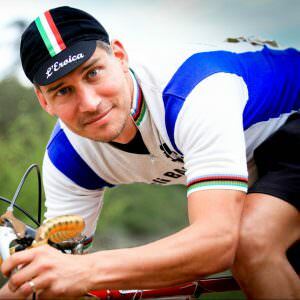 Our trip specialist for Provence he has managed to encourage riders from across the ability spectrum up Mont Ventoux. His patience, good humour and natural propensity to guide make him a super popular member of the team with guests and colleagues alike. Colombier, as it's a great winter ski tour too. Random (and often useless) facts, pretty handy with a Pappagallo (repeating verbatim what somebody else is saying) and an english sense of humour. Not a classic highlight given what it is - pork tripe sausage - but my experience of eating andouillette on our Provence tour will never be forgotten by me or any of those around me! Megan qualified as a Clinical Dietitian 20 years ago, completing additional postgraduate studies in sports nutrition. She has worked in the areas of sports nutrition and clinically within the hospital environment both in Australia and the UK. Megan works with Ride and Seek in the capacity as Nutrition Consultant to help ensure our clients are optimally fueled and hydrated for our tours. Megan helps us design our snack provisions with the right balance of nutrients for our customers, accounting for special dietary requirements and designed to help maintain our energy levels, performance and recovery on tour. I vividly remember getting my school trousers caught in my chain rings down the street from home and having to remove my trousers and run home in my undies. When I'm feeling very energetic, Mont Ventoux! For less energetic days, Col de la Madaleine outside Bedoin. It is really tough to choose one, but I would have to say that the Ride and Seek Japan tour would be up there. I love cycling, sushi, sake and onsen baths so I think this tour ticks all of the boxes. I am strongly customer focused and of course my background as a clinical dietitian comes in handy. I help to advise our team on customer with special dietary requirements and ensuring that snacks provided meet our clients needs for the long days spent in the saddle and recovery. Can I say dinner at our Ride and Seek Provencal base on the Hannibal tour? I love nothing more than preparing a meal for our Ride and Seek customers and learning more about them. At present I look after guide and guest needs from our Provence base, but I have secret aspirations to guide Marco Polo and Maori tours. >Single supplement – Our prices are based on twin/double occupancy. If you wish to have your own room a supplement is applicable. > Deposits – To reserve a place on a stage of this tour you need to pay a deposit of €500 –(or your local currency equivalent). We also accept payment in GB£ and AU$. Simply fill out the Booking Form and once that has been submitted you will be provided with the details required to pay the deposit. The final invoice will include any applicable single supplements or bike hire costs. Normally, unless otherwise requested, we collect the wine kitty monies on the tour itself. Contact us with your specific requirements and any questions you may have. With a strong Italian and Spanish influence the cuisine of Provence has a distinctive flair that sets it apart from more classic French fare. Blessed with an abundance of natural ingredients that flourish in the region, Provence is unsurpassed for the freshness of its produce and variety of its dishes. 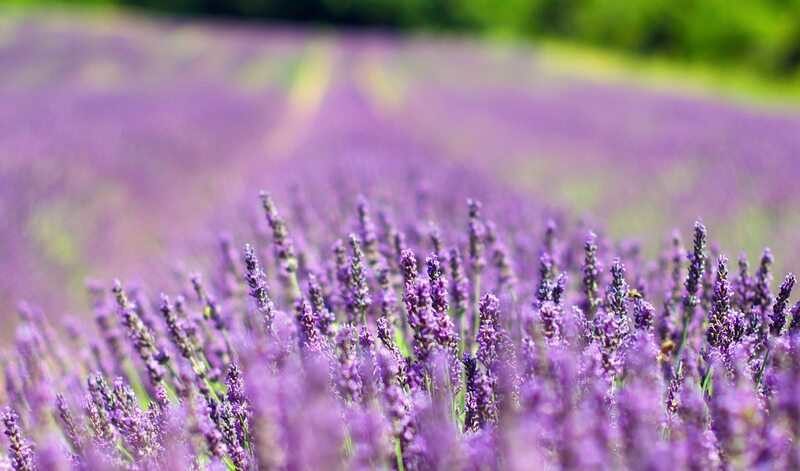 What better encapsulates the flavours of Provençal cuisine than the region’s herbs? Containing rosemary, marjoram, basil, savory and thyme, as well as a variety of other aromatic plants, you’ll be awakened to their presence not just in the food but also in the air as you cycle along. And what about the tapenades? These go so well spread on fougasse – a flat bread with herbs, fig, olive and walnut. We like the original made of capers, black olives and anchovies but why not try the myriad of other options and discover your own favourite? 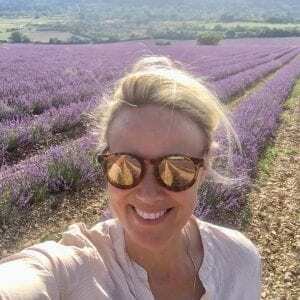 Provence is also one of France’s serious fine wine regions, on a par with Bordeaux and Burgundy. In contrast to the cultured power of Bordeaux and the elegance of Burgundy, Provençal red wines are earthier with an almost rustic flavour. In this respect they are really interesting since quality commercial wine making is balanced by a real sense of identity. Our tour takes us into the heart of some of the regions finest wines and we’ll have the chance to compare and contrast the relative merits of Côtes du Rhône, Les Baux and Côtes du Ventoux. For dessert we recommend the excellent Muscat de Beaumes de Venise – an almost floral, citrus bouquet making them both refreshing and full bodied. Below is a wonderful piece from Bas Steman in Soigneur about the Geant. The peloton shimmers off in the distance. A solo shadow appears on the barren, windswept horizon. The road winds up to a white tower. Reach it, and you’ll kiss immortality. You’ll strike another classic from your list. All the best riders have struggled here. Mont Ventoux is to cycling what Wembley Stadium is to football. The mountain’s menace can’t be captured by statistics, although they are impressive, with more than 20 kilometres of climbing, from 300 metres of elevation up to 1,900 metres, and long gradients at more than 12%. Even the pros suffer. You can suffer anywhere though. In the Alps and the Dolomites, there are mountains of equal magnitude, but Mont Ventoux is the mythical climb. To come to terms with the Ventoux, you have to see it as more than mountain. You can’t reduce it to an elevation profile, a promise of lactic acid. 7.7% doesn’t tell you very much. Mont Ventoux has a story, a history. It’s almost a character in itself. Its stories are woven into cycling’s DNA. Every kilometre is another chapter. Mont Ventoux sits alone, rising out of the countryside, ruling over the land as if it were its sacred kingdom. It flirts with the status of Mount Fuji and Kilimanjaro. Ever since man first put his thoughts to paper, he’s attested to his fealty. For centuries, people spoke of a god who lived at the summit of the Ventoux, commanding awe. He withstood storms and torturous heat. Wolves roamed his slopes, hunting for food. Few were reckless enough to take on the ‘Scala Paradisi’. The poet Petrarch, who defied borders with his love, was one of them. He wrote about his experience in 1336. A year later, the Tour returned, this time taking on the mountain from the south, via the town of Bédoin. A Provençal winegrowers’ village, where Grenache and apricots are traditionally cultivated, Bédoin would have been passed over by time had the Tour not taken on Mont Ventoux. Cycling breathed new life into the myth. People no longer spoke of gods or wolves. Heat, without shadow, and empty air drove riders to their limits. 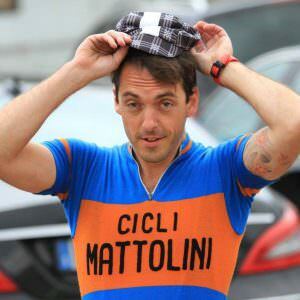 Mallejac rode himself senseless. In 1955, Kubler finished the climb speaking in tongues. Charly Gaul brought the record down to one hour and two minutes in 1958. From Bédoin, an inviting stretch of false flat leads up through the vineyards. It’s nothing to worry about. Whoever wants to set a good time can gain a minute here. But anyone who’s not sure how he’ll fare against the Ventoux had best keep his powder dry. After five kilometres, just past the first switchback to the left, the stairway to heaven rises up. The trees become denser, the road smaller. It hugs the cliffs, without ever offering you a breath of relief. Ten kilometres at ten percent are followed by seven kilometres at seven, then the road pitches up at more than eleven. In high summer, the route is filled with a procession of cyclists — pilgrims on bikes, searching for grace. Everyone follows the same path in his own way. It’s an act of personal confirmation. The Ventoux is a continuously unfolding story, onto which anyone can inscribe his own myth. Anyone who takes it on rides through history. Film after imaginary film is added to the montage. Between your eyelashes, you see Anquetil ride past with hollowed-out eyes. Merckx struggles for breath. Armstrong dances on the pedals. Then, there is the great Italian, Eros, named for desire. A non-climber, he’s minutes ahead, just enough to claim the prize. Whoever strives to live a full life is bound to come close to death. Between the trees, where, for ten kilometres, the road rises at ten percent, it creeps up behind you. It bites into your legs, gnaws at your spleen. Go too deep here and you’ll die on the moon. Just past the Chalet Reynard, lies emptiness. The mountain deceives you. Rarefied air, heat, and wind conspire against you. Above, the chalky stones whirl. You stand on the pedals, collapse. The white tower is further away than your eyes lead you to believe. To your right, a monument looms. Here, in July 1967, the rider with the Union Jack on his shoulders left his life behind in the Tour. He was felled by fame, the heat, dehydration, and madness. One last vicious right-hand corner, a few more metres, and there’s the white line. As soon as you pass it, your wheel ticks off another item from your bucket list. Bas’s account chronicles his experience climbing from Bedoin but there are actually 3 ways up the mountain. 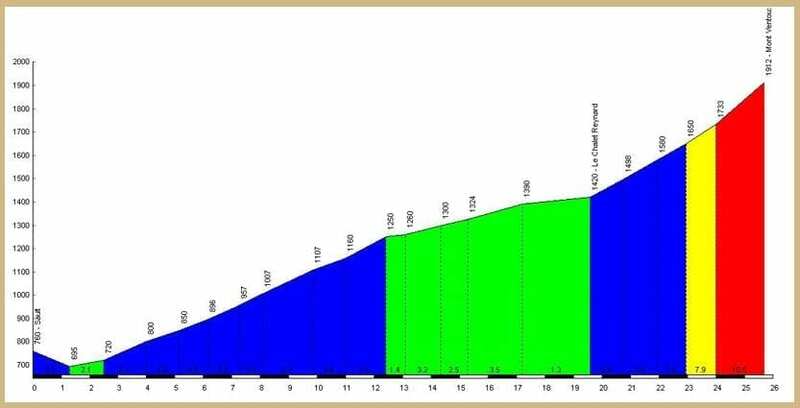 Below are the elevation profiles of these 3 ascents. 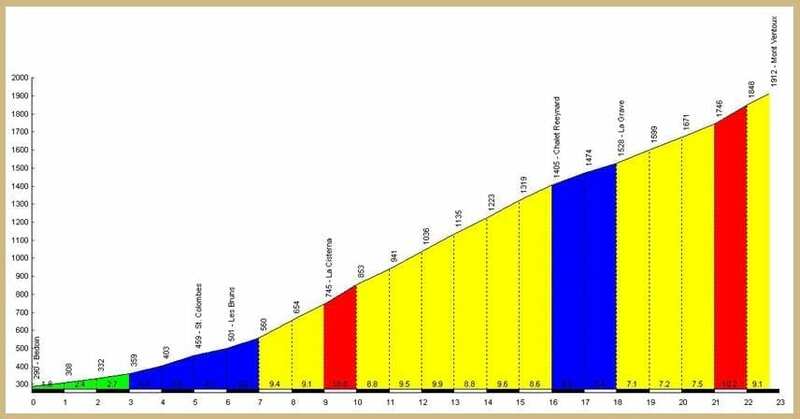 The ‘classic’ is the ascent from Bedoin which is the way the Tour de France typically climbs the mountain. However, the other two also have their merits and our Mont Ventoux weekend gives you the chance to take them on too. The climb from the north side is from Malaucene and is in our opinion on a par difficulty wise with the Bedoin climb. Whereas the climb from Bedoin comes up through the trees until Chalet Reynard the Malaucene ascent is a lot more open with expansive views of the Alps in the distance. The so called ‘easy’ ascent is from Sault and is arguably the most picturesque. Do all 3 in a day and you can join the Cingles club. 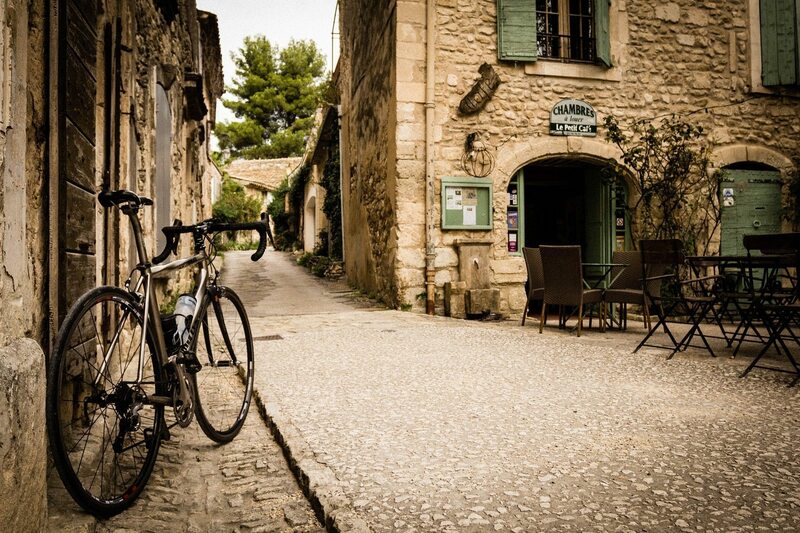 Join us at our base in Provence and take on Mont Ventoux. 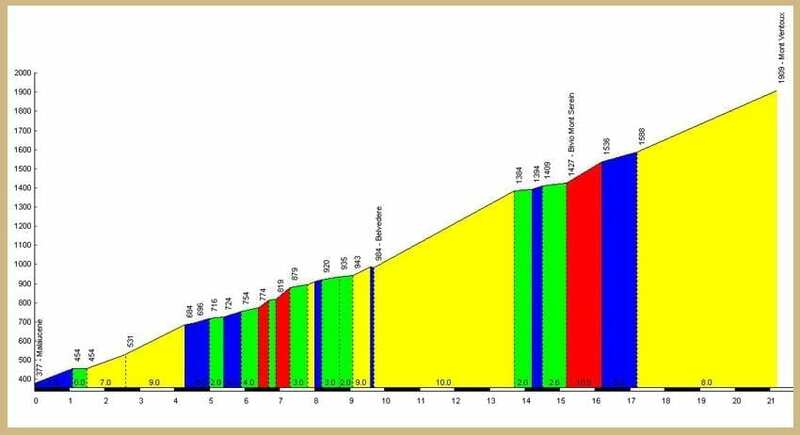 Based around the Santini GF this tour also provides an opportunity to explore the amazing cycling in the shadow of the mountain.